This trip to Disney makes our seventh trip since October. In addition to going on every ride, seeing every show (why is Country Bear Jamboree still around? ), and looking in every store, I have also decided we need to try all of Disney’s special treats. This includes the Dole Whip, churros, popcorn, Mickey pretzels and a few other items. Right now, my favorite is their chocolate chip cookie. When you order the kids meal at pretty much any quick service restaurant you can choose the cookie as a side item. It is incredible. Super soft, light, great thickness level (I will show great maturity here and not make a joke about thickness, as finding the right chocolate chip cookies is serious business), and the perfect amount of chocolate. Averi and I enjoyed the cookies on Saturday. Plus I let her have her first icee. Cherry coke. So good on a hot day. And while I can’t figure out how to make an icee at home, I can try to make the cookies. So today I looked through A LOT of recipes. I decided to try a recipe I found at Kelsey’s Apple A Day. Her picture of the cookies looked just like Disney’s, and she specifically mentions how they don’t spread out but rise up. The words soft and fluffy were used as well. Kelsey gives credit for all of this to using cornstarch. So I kept that in, as well as all the other ingredients from her recipe. The only change I made was using a Hershey chocolate bar, broken up, instead of the chocolate chips. I am refusing to buy chocolate chips until I use most of the baking ingredients I have stockpiled in my pantry. 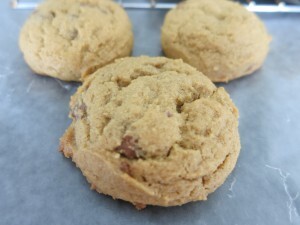 The texture of these cookies was perfect. Just like the Disney ones, and all the adjectives that had been promised. Fluffy, soft, puffy. There was a stronger butter flavor in these cookies, but is that really bad? These cookies will definitely hold me over in between Disney trips. As a side note, I brought some of these cookies to some friends today. They didn’t believe I had made them because all the cookies were perfectly rounded and the same size. 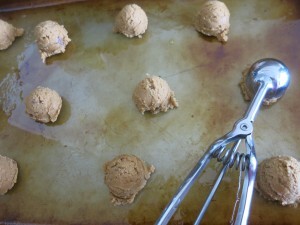 Cookie scoops, people! They are awesome for making cookies with. In a mixing bowl, blend together the two sugars and butter until combined and color has lightened. Add egg and vanilla, blending well. Mix in flour, cornstarch, baking soda and salt. 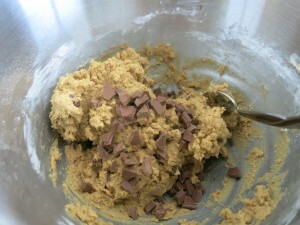 Remove bowl from mixer and gently stir in the chocolate chips. Place tablespoons of cookie dough onto a greased baking sheet. 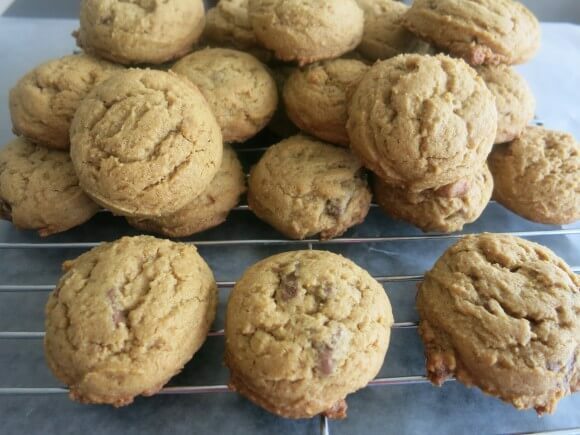 Bake for 8-10 minutes, until the cookies have just started to brown around the edges. The top of the cookies will not be browned, and may still seem soft, but they will darken and harden (but not actually get hard) after removing from oven, so do not overcook. Once the cookies are cooled, remove from baking pan and cool rest of way on wire rack. Then enjoy!